Pediatric aneurysms are rare with an incidence of 0.6--4% , reported in the literature. They occur more commonly in males with a ratio of 2:1 relative to the females  and more commonly in the posterior circulation than in the anterior, with large and giant aneurysms being more common than simple aneurysms. Incidental pediatric aneurysms need early treatment due to increased cumulative risk of rupture. 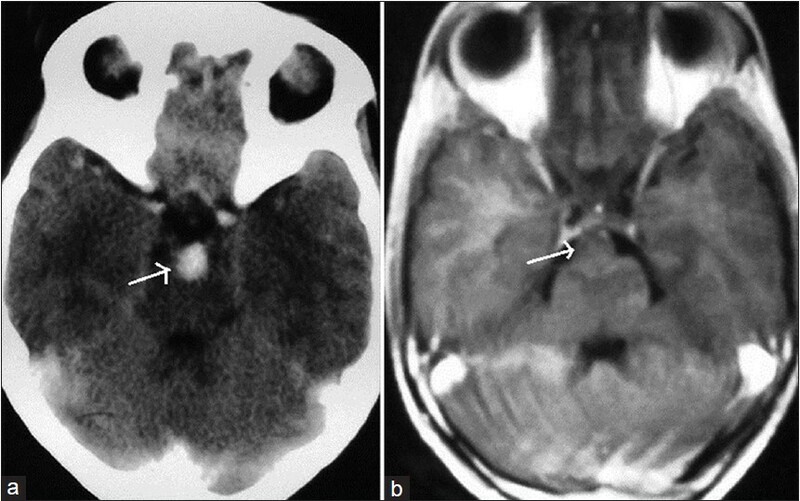 In our present report we describe a case of incidentally detected completely thrombosed basilar aneurysm in a 9-year-old boy, consequently followed up for a period of 1 year by angiography with no evidence of any recanalization. The role of serial follow-up with imaging in this subgroup of aneurysms was emphasized. A 9-year-old male child with no previous significant past medical and family history presented with acute onset of imbalance to left side. Clinical examination revealed truncal and gait ataxia to the left side. 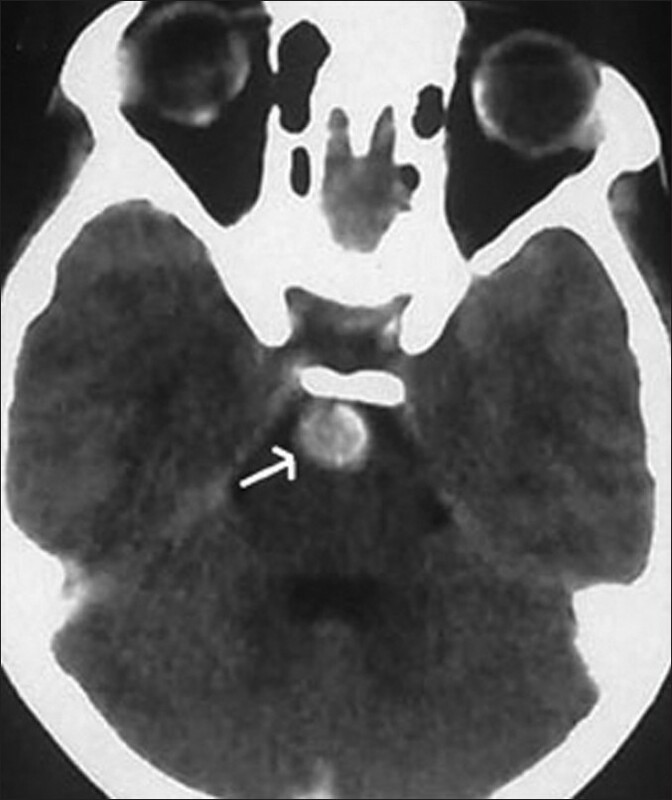 CT scan brain showed the presence of a round hyper dense lesion in the prepontine cistern causing mild mass effect on the adjacent pons [Figure 1]. Magnetic resonance imaging (T1 weighted, T2 weighted, fluid attenuation inversion recovery (FLAIR), diffusion weighted (DWI), apparent diffusion coefficient, gradient echo, and time of flight (TOF) MR angiogram sequences) showed well defined round heterogenous lesion in the prepontine cistern on T1- and T2-weighted sequences with no foci of diffusion restriction on DWI, with minimal mass effect. 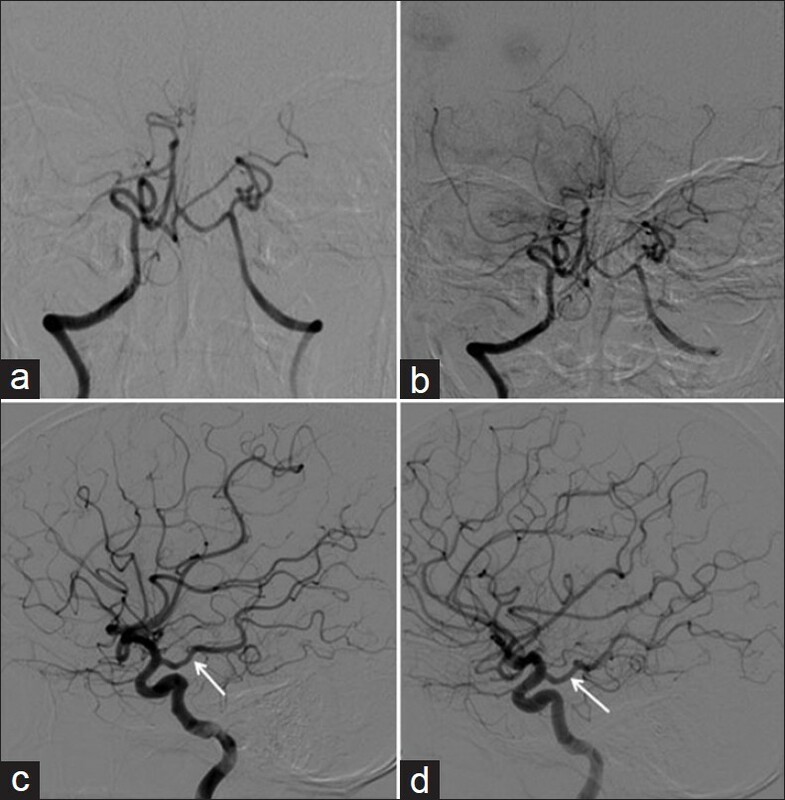 TOF MR angiography showed absent flow signal in the basilar and its branches with bilateral posterior cerebral arteries being filled from the posterior communicating arteries [Figure 2]. These findings were suggestive of thrombosed aneurysm; however we went ahead with digital subtraction angiogram (DSA) to confirm the same. DSA done did not reveal any aneurysm. There was no flow seen in the basilar on vertebral angiogram [Figure 3] with good reformation of the bilateral posterior cerebral arteries from the posterior communicating arteries on internal carotid angiograms. Detailed screening was done to rule out any associated conditions such as autosomal dominant polycystic kidney disease (ADPKD), fibro muscular dysplasia, and coarctation of aorta, Ehlers syndrome, and Marfans syndrome. The symptoms of the child improved gradually over the next 1 month. In order to detect any possible recanalization over the course of time we followed up the child with repeat angiography at an interval of 1 year. We did not find any evidence of recanalization and the angiographic findings [Figure 4] and [Figure 5] were same as before. We present a rare case of spontaneously thrombosed nongiant basilar tip aneurysm confirmed with CT, MR, and DSA. The importance of serial follow-up in these cases was emphasized. To our knowledge this is the first case report of spontaneous thrombosis of nongiant basilar aneurysm presenting as an acute event and simultaneously followed up to rule out the early recanalization and to understand the natural history. 1. Liang J, Bao Y, Zhang H, Wrede KH, Zhi X, Li M, et al. The clinical features and treatment of pediatric intracranial aneurysm. Childs Nerv Syst 2008;25:317-24. 2. Vaid VK, Kumar R, Kalra SK, Mahapatra AK, Jain VK. Pediatric intracranial aneurysms: An institutional experience. Pediatr Neurosurg 2008;44:296-301. 3. Lasjaunias PL, Campi A, Rodesch G, Alvarez H, Kanaan I, Taylor W. Aneurysmal disease in children. Review of 20 cases with intracranial arterial localisations. Interv Neuroradiol 1997;3:215-29. 4. Rao V, Mathuriya SN. Pediatric aneurysms and vein of Galen malformations. J Pediatr Neurosci 2011;6:109-17. 5. Brownlee RD, Tranmer BI, Sevick RJ, Karmy G, Curry BJ. Spontaneous thrombosis of an unruptured anterior communicating artery aneurysm. Stroke 1995;26:1945-9. 6. Cohen JE, Rajz G, Umansky F, Spektor S. Thrombosis and recanalization of symptomatic non-giant saccular aneurysm. Neurol Res 2003;25:857- 9. 7. Batjer HH, Purdy PD. Enlarging thrombosed aneurysm of the distal basilar artery. Neurosurgery 1990;26:695-700. 8. Schaller B, Lyrer P. Focal neurological deficits following spontaneousthrombosis of unruptured giant aneurysms. Eur Neurol 2002;47:175-82. 9. Cohen JE, Yitshayek E, Gomori JM, Grigoriadis S, Raphaeli G, Spektor S, et al. Spontaneous thrombosis of cerebral aneurysms presenting with ischemic stroke. J Neurol Sci 2007;254:95-8.